Greetings from Editor-in-Chief and Editorial Office of Translational Cancer Research! 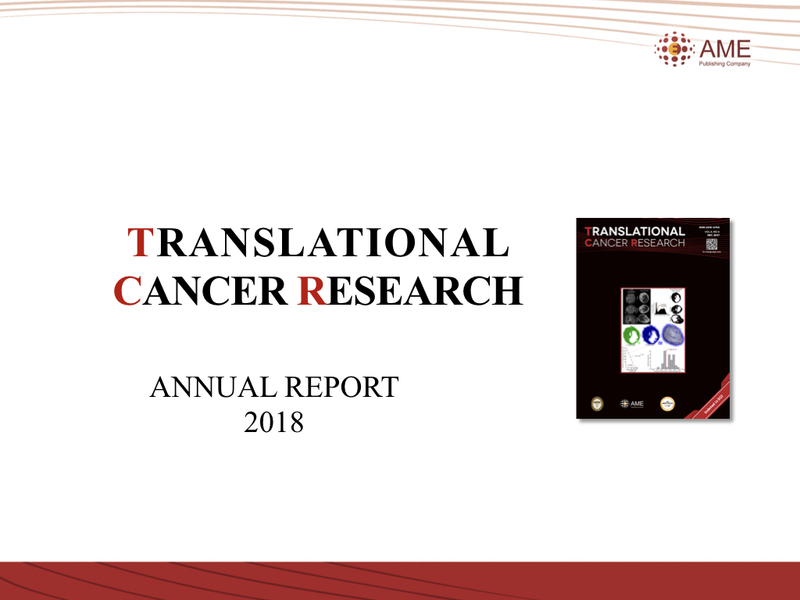 We are pleased to share the 2018 Annual Report of Translational Cancer Research here. In 2018, TCR developed smoothly and made some significant progress under the join-efforts of experts worldwide. Three high-quality focused issues have been published, they are on “Technologies in Liquid Biopsies”, “Update of Current Evidences in Breast Cancer Multidisciplinary Management”, and “Prostate Cancer”. More information is shown in the Annual Report. This issue focusing on the primary liver cancer is guest-edited by Dr. Giovanni Brandi and Dr. Francesco Tovoli from University of Bologna, Bologna, Italy. Papers published in the issue represent a critical point of view on well-established therapeutic options and new perspectives in the very complex field of NSCLC patients management with also an interesting focus on communicational issues in the precision medicine era, to support the oncologist to select the best therapeutic approach for advanced NSCLC patients. This issue focusing on the current understanding and future directions of prostate cancer is guest-edited by Dr. Israel Deutsch, Dr. Charles G Drake, and Dr. James McKiernan from Columbia University Medical Center, New York, NY, USA. It is specifically thought to provide the reader an insight of most recent evidences regarding the current understanding and future directions of prostate cancer. This issue focusing on breast cancer is guest-edited by Dr. Gianluca Franceschini, Dr. Alejandro Martín Sánchez and Dr. Riccardo Masetti from Multidisciplinary Breast Center, Fondazione Policlinico Universitario Agostino Gemelli, Università Cattolica del Sacro Cuore, Rome, Italy. Neoplastic cells use various intercellular communication mechanisms in order to adapt to the local microenvironment, manipulate the immune system, and facilitate metastasis. Exosomes release is a new mechanism of cell-to-cell communication. These nanovesicles enclose various types of molecules including lipids, proteins, DNA, messenger RNA (mRNA) and non-coding RNAs [microRNA and long non-coding RNA (lncRNA)]. Extracellular vesicles (EVs) play a pivotal role in cell to cell signalling in both physiological and pathological conditions. Based on their biogenesis, three main classes of EVs are recognized: exosomes, microvesicles and apoptotic bodies. Exosomes are cell-derived vesicles (EVs) present in many body fluids (blood, urine, milk, cerebrospinal fluid) ranging in size from 30 to 150 nm. This review outlines the major trends in the investigation of circulating cell-free DNA-based methylated markers, including key technical aspects of the circulating cell-free DNA methylation analysis, recent advancements in methylation detection techniques, and most successful examples of their combined use. The potential of cell-free circulating tumor DNA (ctDNA) as a diagnostic, predictive and prognostic biomarker, has clearly been recognized and numerous studies have already proven clinical utility of ctDNA analyses. As ctDNA reflects the full spectrum of tumor-specific alterations, a wide range of methodological approaches have been developed for the analysis of ctDNA. Curative therapies for cancer are often successful when it is early detected and treated. Cancer screening aims at detecting cancer at early stages, before symptoms appear, and when the treatment is most likely to be effective. But most cancer types lack well-established biomarkers allowing the identification of the disease. Non-invasive tests, such as liquid biopsy, hold promise for screening people for cancer and could help advance cancer early detection. In advanced countries, 98% of upper extremity lymphedema (UEL) are secondary to breast cancer treatments. Nevertheless this disease is quite common, it has been usually neglected and underestimated due to the scarce knowledge about the lymphatic system and the unavailability of effective treatments. As consequence, breast cancer patients are usually not well instructed about the risk of this disease and once UEL is diagnosed they are usually not follow-up by doctors but send for consultation to physical therapist only. The achievement on the biological behaviour and natural history of breast cancer demonstrates the same effectiveness and oncological safety of breast conserving surgery (BCS) followed by radiotherapy than mastectomy. The goal of BCS for patients with early-stage breast cancer is the complete removal of the tumor keeping sufficient surgical margins and maintaining at the same time the natural shape and appearance of the breast. Breast lymphoma (BL) is a rare entity. Although mimicking clinical presentation and radiological features of epithelial breast malignancies, prognosis and treatment management are different. Here we report our single institution experience in such population. Prestigious editorial board members of Translational Cancer Research (TCR) recommend the journal according to their knowledge to TCR and their personal interaction with it. The editorial team appreciate supports from the Editorial Board Members. Below are the latest Translational Cancer Research articles published online ahead of print publication. Is transformed small cell lung cancer (SCLC) different from de novo SCLC?